Hot Towel Warmers - 68 litre, 2 door unit - a Restaurant favourite. Hot Towel Cabinets suitable for use in Salons and Restaurants. 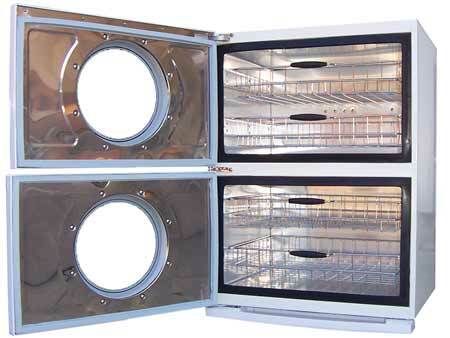 Hot Towel Cabinets - 68 litre, twin unit. Restaurant favourite. (#CAPM002). Two removable shelves inside in each cabi. Heats to approximately 73° C.
Auto setting or timer for 30 or 60 mins. Power specification - 240 volts, 50 Hz, 500 watts. External: 45 x 40 x 63 cm (L * W * H). Internal: 2 units of 40 x 30.5 x 23 cm (L * W * H). Best outcomes occur when using Face Towels in Hot Towel Warmers. Normally these would be wet but dry is also acceptable. priuor to putting them in a basket. Soaking wet is OK but they should not be dripping water. Our Towel Cabinets can be delivered anywhere within Australia wide. Payment types accepted include PayPal, Mastercard or Visa. Bank transfer and Cheque also accomodated. Further details can be obtained on (02) 6162 1950 or email us. * Inspection of items are available at our store in Canberra.